One of the sustainable brands from DW Fine Pack Inc., — a longtime manufacturer of distinctive, high quality packaging for the foodservice, restaurant, grocery and food processor industries. DW Fine Pack is committed to providing the best food packaging/disposables products on the market with unequalled commitment to the environment. 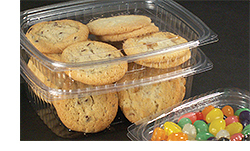 DW Fine Pack was one of the first companies in North America to introduce, disposable foodservice packaging products made from NatureWorks® Ingeo™— a biopolymer made from 100% renewable resources. DW Fine Pack branded their bioplastic material as NaturesPLAstic®, and subsequently developed several product lines with unique, superior qualities well suited to the industry. Maximize deli and produce visibility with DW Fine Pack’s dependable 2-piece deli packaging for salads and mixed items. Its sturdy, crystal clear construction includes an attractive square hinge design with a flat lid for convenient stacking.